When we think about the holiday season, we get fond memories of sitting by a fire, drinking hot cocoa, putting up decorations, and—best of all—listening to some classic Christmas music. There’s nothing like sitting back, enjoying the comfort of a big sweater, and hearing your favorite holiday tunes to warm you up in the December cold. 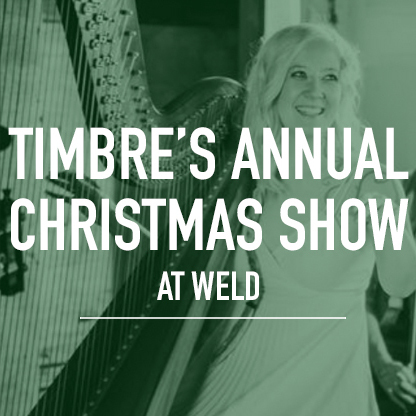 Local harpist and songwriter Timbre wants to bring families together and get a head start on that holiday cheer with her annual Christmas show on December 11 at WELD Nashville. She’ll be joined by her band, a string and brass orchestra, and the SONUS choir to reimagine some of our favorite Christmas classics. Doors open for the all-ages show at 7 p.m. and the music begins at 7:30 p.m. We recommend heading over early to nab some free hot cocoa and meet some fellow Christmas fanatics. You can find more information and get your tickets here.